Californians purchasing a new Civic Natural Gas vehicle (http://automobiles.honda.com/civic-natural-gas/) are now eligible for special savings from the California Energy Commission – an immediate $1,000 purchase credit1 supplied directly by certified Honda Civic Natural Gas dealers at the time of purchase. In addition to the purchase credit savings, Civic Natural Gas vehicle customers in California have the added benefit of qualifying for single-occupant access to High Occupancy Vehicle "carpool" and High Occupancy Toll (HOT) lanes2. California has the most robust natural gas fueling infrastructure in the nation with more than 150 stations in the state. With a combined EPA fuel economy rating of 31 mpge3‡ and a fuel cost savings of up to 40-percent compared to gasoline, the Civic Natural Gas vehicle can significantly reduce consumers' pain at the pump. The Civic Natural Gas, powered 100-percent by cleaner-burning, abundant and primarily U.S.-sourced natural gas, can be refueled in a matter of minutes, much like a conventional gasoline-powered car. The Civic Natural Gas' interior has been enhanced with a host of new standard features including more premium seating materials and door panel trim, as well as new Display Audio with 7-inch touchscreen that allows users to pinch, swipe and tap just like a smartphone to access audio, phonebook, media, vehicle information and available navigation features. Also new for 2014, the available Civic Natural Gas Leather Navi model gains additional premium features such as leather seats, heated front seats, heated side mirrors and a six-speaker audio system. 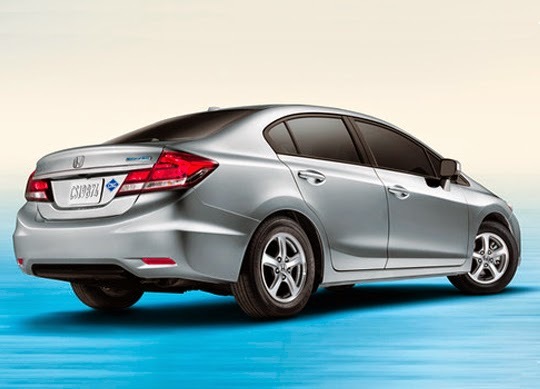 The only dedicated CNG-powered passenger car available for retail purchase from a major automaker, the Civic Natural Gas is manufactured exclusively by Honda Manufacturing of Indiana in Greensburg, Indiana, using domestic and globally sourced parts. Retail customers and fleet clients interested in receiving the $1,000 purchase credit with the purchase of a new Civic Natural Gas vehicle (up to 20 vehicles per fleet client or retail customer) must make their purchase from a certified Honda Civic Natural Gas dealer while California Energy Commission purchase credits remain available. The supply of purchase credits through the California Energy Commission is limited to 1,600 and expires when all have been distributed or on April 22, 2015, whichever occurs first. California leads the nation in the number of statewide compressed natural gas stations. Consumers interested in learning more about local compressed natural gas refueling sites can visit the California Natural Gas Vehicle Coalition web site for a listing of stations in their area. Honda's diverse portfolio of alternative fuel vehicles has included numerous technologies to improve fuel efficiency and reduce CO2 emissions including the first EV leases in California (1997 Honda EV Plus), the retail introduction of America's first hybrid (1999 Honda Insight), delivery of the first fuel-cell electric vehicle in the U.S. (2002 Honda FCX) and five generations of the Civic Natural Gas (first introduced in 1998). Honda has been recognized as among the top automakers in the Union of Concerned Scientists' (UCS) rankings of overall vehicle environmental performance since 2000, and a Honda vehicle has been included on the list of America's greenest vehicles from the American Council for an Energy-Efficient Economy (ACEEE) for the past 16 years. "With gasoline prices forecasted to rise in California this summer, attractive offers like purchase credits make this a great time to purchase a Civic Natural Gas vehicle," said Steve Center, vice president of the American Honda Environmental Business Development Office. "If you're looking to save money at the pump, spend less time in traffic, and reduce your environmental impact, the Civic Natural Gas Vehicle is an ideal choice." 1 While supply of California Energy Commission funds last. Available only at participating Honda-certified Civic Natural Gas Dealers. See participating dealers for details. 2 White Clean Air Vehicle Stickers are available to an unlimited number of qualifying Federal Inherently Low Emission Vehicles (ILEVs). Cars that meet these requirements are typically certified pure zero emission vehicles (100% battery electric and hydrogen fuel cell) and compressed natural gas (CNG) vehicles. Per AB 266, the expiration date for the white stickers has been extended to January 1, 2019. Single-occupant access with a qualifying vehicle to the California State Route 110 and Interstate 10 High Occupancy Toll (HOT) lanes in Los Angeles County has been extended through January of 2015 pending state legislative approval. See the California Air Resources Board's web site for more information: http://www.arb.ca.gov/msprog/carpool/carpool.htm. 3 Based on 2014 EPA mileage ratings. Use for comparison purposes only. Actual fuel mileage will vary depending on driving conditions, how the vehicle is driven and maintained, battery pack age/condition (hybrid only), and other factors.